PG Group and Willis Newson are inviting people living in St Pauls, Stokes Croft, Montpellier, Redland, Kingsdown, Broadmead and Cotham to find out about possible arts, heritage, cultural activities and enterprise opportunities there are for the ground floor of the redeveloped Carriageworks and Westmoreland House and to share your thoughts and ideas. 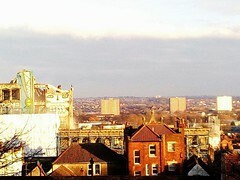 The buildings have been derelict since the 1980s and have been purchased for development by Bristol based developers PG Group. Work has started on the demolition already and will complete in Summer/Autumn 2020. Central to the exciting new development is the creation and implementation of a Cultural Plan and Public Art Strategy for the site that will support the new building to thrive and support the local social, cultural and economic ecologies of the area. For the last 9 months, Willis Newson have been having discussions with Carriageworks Action Group and PG Group and running consultation sessions, community meetings and focus groups to develop a Cultural Plan and Public Arts Strategy for The Carriageworks and Westmoreland House on Bristol’s Stokes Croft. They are keen to share the findings to date with the community in advance of the plan being finalised. Ideas to date include a community-led process of co-commissioning and leading on a programme of activity, a market area for local artists and traders, heritage projects and a community hub space for cooking and events. There will be a drop in at The Citadel (Salvation Arrmy), 6 Ashley Road from 2-6pm on Wednesday September 12th as well as a more facilitated presentation and discussion in the space from 6:30pm-8pm. Everyone is welcome and hot drinks will be served. Bristol Post carries a story today that the discovery of asbestos in Westmorland House has delayed demolition by a further four weeks. CAG’s understanding is that asbestos in the building was removed years ago but rather than safely remove it from the site the workers tipped some of it in the lift shaft. While this was known locally there was no hard evidence. Consequently it would only have been confirmed by the contractors once it was safe to start excavating the lift shaft i.e. quite recently. Just another twist for the complicated develoment! As you know, there is a CAG meeting on Wednesday July 18th at 6pm (latecomers welcome!) at St Paul’s Learning Centre to talk about what we want to see included in the cultural plan for the development. Jane Willis from Willis Newson and Kim Wide from Take A Part, who have been commissioned by the PG Group to write the plan, will be there to hear what you have to say. They have already spoken to a range of people individually and in small groups, so if you have already seen them, please bear in mind that this evening is a chance for others to be heard. Heritage: What aspects of the area’s heritage do we want to see celebrated within the site? Community and Partnerships: How can we create a place that is inclusive and welcoming to all? Public Realm: How else would we like to see the space used, in ways that respect the needs of residents and neighbours? These are big questions and there is never enough time. As usual Lori will try to pick up on everyone there, but all of us cannot realistically expect to talk about every point, so everyone will have a chance to add their thoughts on post-it notes. If you are unable to come in person please feel free to send your suggestions, ideas and dreams to CAG: ideas@carriageworks.org.uk and to Jane and Kim at Jane@willisnewson.co.uk or drop in a note to Willis Newson at Utility House, 3 York Court, Upper York Street, Bristol, BS2 8QF. Please try to keep within the framework of the questions. We will also send round a summary of everything we have received on email and at the meeting after the event. Following this event, there will be an open day running from 2pm-8pm on Wednesday 12th September, venue tbc, when Jane and Kim will share the draft ideas being developed from the consultation process in order to seek further feedback and input before the Cultural Plan is drafted in October. After the Cultural Plan is agreed, we will be looking at management of the site, but that is for another time and outside the scope of this meeting. Best wishes Lori and the liaison group. There will be a meeting for residents and others on 18th July 2018, 6-8pm, at St Pauls Learning Centre to contribute to the development of the cultural plan for the Carriageworks. This meeting was specifically requested at the Community Meeting in June. Willis Newson, who are writing the cultural plan for the developers, PG Group, have agreed to this special session to allow residents who have not been involved in the consultation to date to have their say.